How are you going to keep your kids busy during Spring Break this year? During our Spring Break my kids are usually camped out in front of the TV in their PJs watching Paw Patrol, my house is a disaster, and I feel a lot of mom guilt because I want to do something fun and engaging with them but I’m usually not organized enough! This year I am ahead of the game and I planned ahead! I am so excited to share my easy and inexpensive idea with you a 5 day virtual Spring Camp for kids! I’ve worked with two of my buddies to put everything together to help you feel organized and on the ball for Spring Break just like me! Some years we go away on vacation during Spring Break and sometimes we stay home. Whenever we stay home, I am always scrambling to find simple ways to entertain my kids that aren’t too expensive and that don’t leave my house a complete disaster! I feel so much better when we do at least one activity together each day that gets our creative juices flowing and brains working! 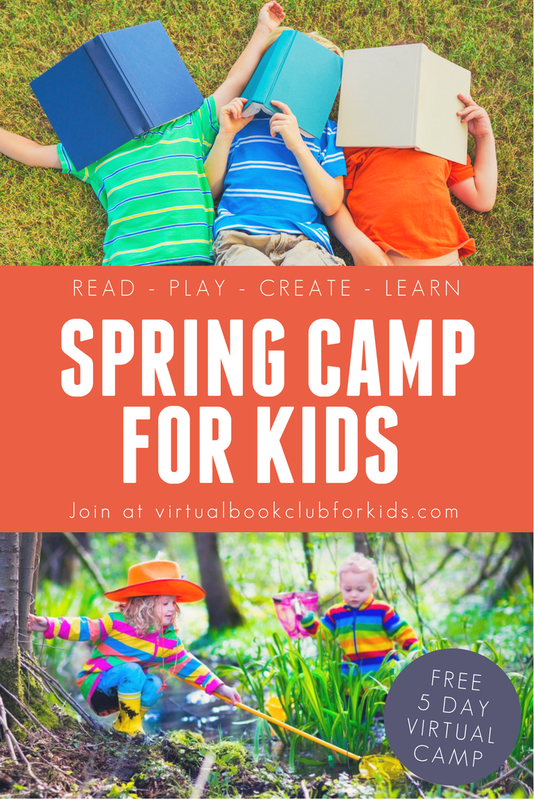 This year we created an easy-to-use Spring Camp format that is similar to our Virtual Book Club for Kids Summer Camp! Spring Camp is FREE and can be used all Spring long! We do the planning, email you what to do with your kids each day, and then you can take all of the credit! Spring Camp is for kids ages 2-8! Since I have a 10-year-old, 7-year-old, 5-year-old, and 2-year-old, I’ve worked with my team to make sure that our Spring Camp activities can be adapted and used for multi-aged groups of kids! We’ve included suggestions for how to adapt the activities for older or younger kids on each activity page so that you help involve everyone if you have a range of ages at your house. 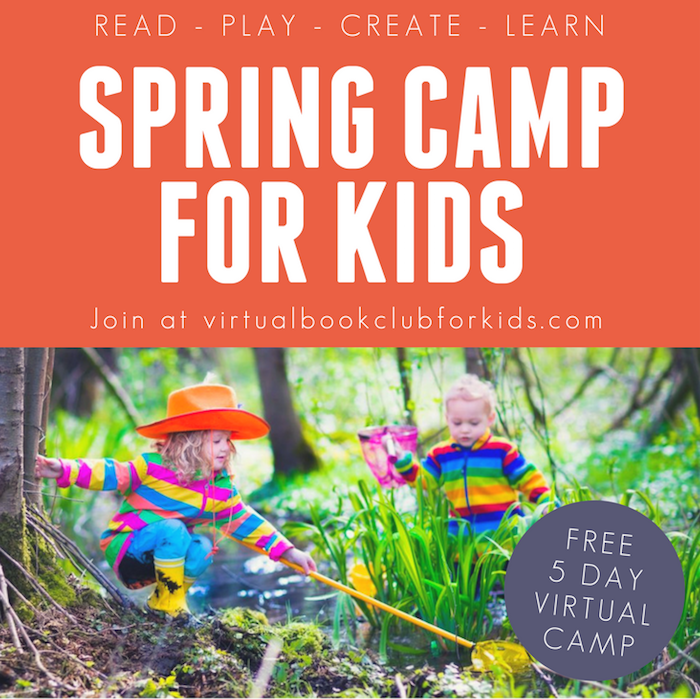 Spring Camp is hosted by the creators of the Weekly Virtual Book Club for Kids! All year long Kim, Cerys, and I share book themed activities for kids and we are excited to have you join us for this bonus week of fun! Most of the supplies we’ll be using are things you already have around the house or you can purchase inexpensively… like yarn, paint, glue, etc. Our goal is to make spring break easy and entertaining for you and your kids and take a little stress off of planning things each day! When you sign up for camp, we’ll send you a printable supplies list that you can print off or just use on your phone. Why join our Spring Camp for Kids? Spring Camp is an easy way to keep the kids busy & having fun in an inexpensive way this Spring! You can learn something new every day! Spring camp focuses on simple science, sensory, art, literacy, and movement activities. This year our theme is bugs and butterflies! Create & connect with your kids and make the most of your time together! Explore awesome children’s books each day! We’ve picked a few books to highlight, but we also have a long list of additional Bug and Butterfly themed books that kids of all ages will enjoy. We even included a few chapter books you can read together! We will send you an email every day for five days with just ONE simple activity to try. Spring Camp officially starts on March 26th, but you can sign up anytime during the spring and start whenever it works for you! We’ll give you a Materials list, Book list, and Bonus activities list within the first day after you sign up! We’ll be easily accessible via email or in our Weekly Virtual Book Club Facebook group if you need any additional ideas or help to plan the best spring camp ever! Just reply to our daily newsletter or post in our Facebook group and we’ll get back to you ASAP. What if your kids already had Spring Break? If your kids already had Spring Break, no big deal! We are providing these free Spring Camp materials for you to use all Spring long! You can use the activities after school with your kids or even do them all on the weekend. I encourage you to look at your schedule and see what works for you! These are easy to fit into whenever you have time. Are you ready to join our Spring Camp for Kids? It is super easy! Just click on the link below for more information and to register! Once you register, you'll get a welcome email right away!